Happy Friday to you! I hope everyone has had a wonderful Friday. I know, I was very looking forward to this weekend. 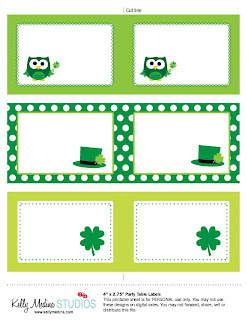 I have a freebie to give away for St. Patrick's Day parties or for folks that just love green, shamrocks and cute! These are perfect for table labels, stickers, bag tags or maybe even name tags. You can download them on a new Freebie page I added to my website. Click here. 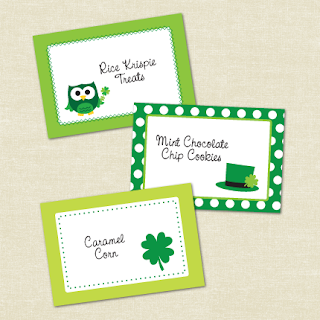 For the table labels these work great if you print on cardstock of your choice, stick some adhesive (glue or tape) on the back and attach to another folded piece paper to form a tent on the table. You could write food or treats in the blank space. Or they could even work as a table placeholder. Wow thanks Kelly!! That is a really cool freebie!! I will definitely spread the word!! how very super cute and festively fun! Wow! Really awesome. Thanks for sharing it.